Kitties and shopping and books, oh my! It’s not about any of that. It’s about my journey to skinny jeans and how I’ve made peace with my body at age 36. It has been a long and bumpy road. Journey with me. Yes, I was adorable, I know. But I was always the biggest (tallest AND fattest) kid in the class, up through and including sixth grade. And kids, as you may have heard, are mean. And that kinda stayed with me through all of these years. I may have lost a few and gained a few through the years, but even when I got down to a size 4 in my 20’s, I was still the fattest girl in Mrs. McGrath’s 2nd grade class, weighing in at an impressive 94 pounds – 9 pounds more than the next “fattest” kid in the class, who had the last name “House” mind you. That’s right. I was fatter than a house. How do I know these details? Because despite 8-year-old Heather asking nicely to keep her weight quiet, Mrs. Briscoe, the nurse, still insisted on announcing everyone’s weight aloud as she wrote them down. A little sick that this is a memory that is imprinted on my mind for all of these years. Another fond elementary school memory: 5th grade. Riding the bus home from school. “Steve” decides to tell me, unprompted, that “If I were a mermaid, I’d be a manatee.” Yup, that one sorta stayed with me too. So, I’ve had some fat baggage that I’ve been lugging around since, oh, age 5 probably. And my recent experience with a certain pair of skinny jeans has caused me to do a little introspection. Anyhow, I got it stuck in my head that I must own a pair of cream-colored skinny jeans for the fall. I MUST. Life will not be complete, Heather, unless you seek out and find these pants. I’m more of a wide leg, dark-colored pants gal normally. But, all of these pretty photos of ladies on Pinterest wearing cream-colored pants and boots frolicking through autumn fields… picking apples… just hanging around without cellulite. I wanted to be in that club in the worst way. I took a trip to (where else?) my faithful local Marshall’s. Now, if you’re a Marshall’s regular, like myself, you know very well that you can’t say to yourself, “hey, I’d like to go and purchase a pair of black peep toe heels” and expect to find them at Marshall’s. Its more of a “go with an open mind – you never know what you might uncover” sort of store. 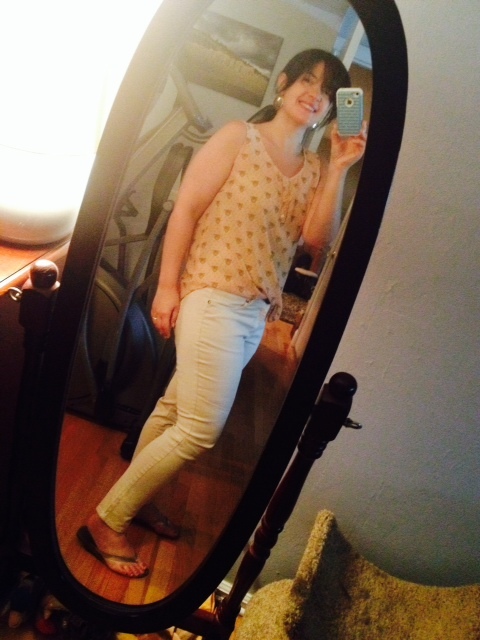 But, the skinny pants gods smiled upon me that day, and lo and behold, there they were – cream-colored skinnies. In my size. I tried them on, and although they fit like a glove, I was skeptical. I am bottom heavy. I am so pear that I’m almost eggplant. I’m what my husband might refer to as “assy” – but in a good way. And I was besot with thoughts like “these make my thighs look massive” and “oh can you see my cellulite? ?” But, I bought them, because at Marshall’s you gotta get it when you see it, because it will be gone the next time you come back. I took them home. I tried them on with about 78 things that I already owned. Boots. Flats. Tunics. Sweaters. I was unsure. I thought they looked decent, but I was unsure. I polled the masses. My mom loved them. My friends were split. I had trouble sleeping that night – no exaggeration – because I was so pissed off that I didn’t trust myself and how I felt in these pants enough to flout whatever nay-sayers might think when they saw a non-size 2 girl in light-colored skinnies. Well, reader, I re-bought them. And so, this is what I think. You don’t have to be skinny to wear skinny pants. Or a sleeveless shirt. Or a strapless dress. Or whatever that one item is that you consider to be off-limits. 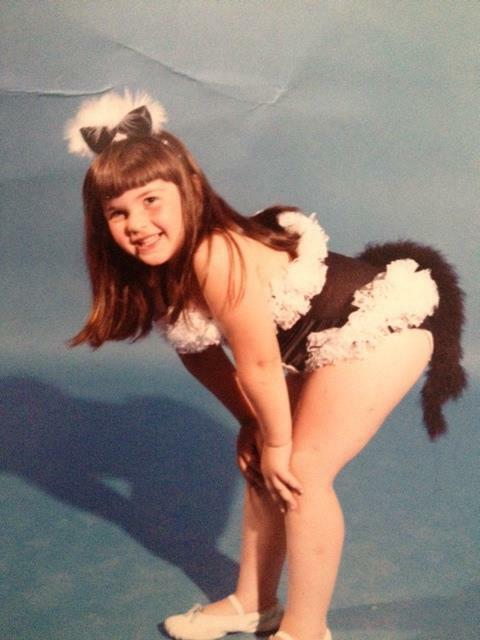 Despite what that little person inside might be telling you (in my case, elementary school chunky Heather) YOU look good. Do you feel good? Then you’re fine. Just make sure the item fits and flatters. If these jeans gave me a muffin top it wouldn’t indicate confidence – it would just tell people that I was in denial about gaining a few pounds or suggest that I don’t own a full length mirror. Dress for the size you are today. I never wear my swimsuit in front of people EVER unless I’m in a foreign country. Its true. Recently, I had an hour to kill while my husband was at the gym at a resort (in New Jersey – not a foreign land) at which we were staying, and so I sat by the pool for an hour. In my bathing suit. And you know what? The world didn’t end. My guess is that no one even gave me a second glance. But in a good way. I don’t expect this to “inspire” people and I don’t expect applause. I just hope that, ladies, you extend your body the same courtesy that it extends unto you. I’ve had an almost abusive relationship with my body for years, treating my “flaws” like an abusive husband might treat his battered wife. And I don’t think I’m alone on this. You’re ugly, you’re fat, you don’t deserve to wear this. And you know what? Our bodies don’t fight back. They just faithfully keep us healthy, carry us where we want to go, bear our children. Hell, mine climbed a mountain for me, dammit! Granted I did fall down and vomit when I was done, but still. I asked my body to climb 4 miles uphill and it didn’t answer me back. It just climbed. Its time we start showing our bodies some respect. Here are the pants. I’ll wear them proudly this fall and pick some apples or something. Maybe carve a pumpkin. This entry was posted in The Lit Kitty - General on August 6, 2014 by mimacat14. As a friend who originally voted yes…yay!!!! Well done! As an upper-arm-a-phobe you have almost, ALMOST inspired me to tank top it up. 🙂 Inspiring post!!! I like them much better with this shirt. Definite yay now! I’m glad you went back for them. Yay!! I think it’s great that you went back and got them, going with your own gut instincts! Having just had 3 babies in four years this helps because even though I weigh less now then I did before my first, my body is totally different and it has taken awhile to accept that. Thanks for a great post. Yay! Glad you went with your instincts. I am in my late 30s, and in the last few years I have come to except that I like to be sleeveless. Yes, my arms are flabby, but wearing sleeves doesn’t magically make me thinner; it just makes me sweaty & constricted. Hi! I just found your blog tonight from your stitch fix greatest hits post. And I stumbled into this post. Can I please just tell you thank you for this post? I just started with stitch fix last month (kept 3 of the 5 including my very first ever little black dress!) Anyway, I’m don’t have weight issues so to say but rather issues that I never think anything looks right on me. So I refrain from wearing clothing styles that I really like because I think they will look stupid on me. Your post hit a spot with me and made me realize that I’m always too hard on myself about how I think I look. And now I’m off to pin some things to my stitch fix board that I like but may be out of my normal “I won’t look good in that” comfort zone! So thank you for a very well stated post! You made my night. Awesome 🙂 I’m glad you liked it! I'm Heather. English Professor & wife & momma to Jake & cat mom & church singer & Game of Thrones addict. I love to read, write, practice yoga, sing and hang with my family. Welcome to my world!